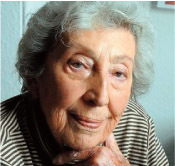 Dr Jacqueline Porret-Forel died on March 28, 2014. Born in Morges, Switzerland, on July 4, 1916, Porret-Forel studied medicine. In 1941 she came across Aloïse Corbaz in the La Rosière asylum at Gimel, where she was briefly posted. She devoted her medical thesis to the artist, bringing her to the attention of Jean Dubuffet. A member of the early Compagnie de l’Art brut in Paris and a founder member of the Collection de l’Art brut in Lausanne, Porret-Forel became president of the Aloïse Foundation. Collector and patron Charlotte Zander passed away at her home in Munich on March 12, 2014, aged 83. Zander had built an extensive collection of naïve art, Art Brut, and outsider art over more than 60 years, with over 4,500 paintings and sculptures. In 1997 Zander was awarded the Art Cologne Prize. 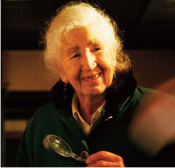 In 1970 she founded the Galerie Charlotte Zander in Munich, which became a centre of dealing for the art of autodidacts. In 1995 she closed the gallery in order to devote herself to her collection and in 1996, she founded the Museum Charlotte Zander in Schloss Bönnigheim, where her collection is presently held. 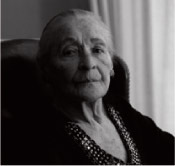 Art dealer, collector and curator, Monika Kinley, died aged 88 on March 9, 2014. In 1977 she met dealer and curator Victor Musgrave, an early campaigner for outsider art who in 1979, with Roger Cardinal, curated the seminal "Outsiders" exhibition at London's Hayward Gallery. Following Musgrave's death in 1984, Kinley took on his work, expanding and finding a home for their collection. After being on loan at the Irish Museum of Modern Art, 800 works are are now housed in the University of Manchester's Whitworth Art Gallery. On April 26 and 27, 2014, as part of the Raw Vision 25 years exhibition at Halle Saint Pierre and in partnership with the Festival de l’Imaginaire, House of World Cultures, Univers Imaginaires de gens ordinaires (“Imaginary World of Ordinary People”) is a two day film festival. 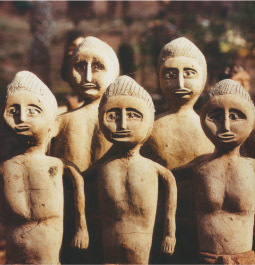 25 films on contemporary folk art, Art Brut and environments created by self-taught artists are presented. Entry is free but reservation by telephone is recommended. 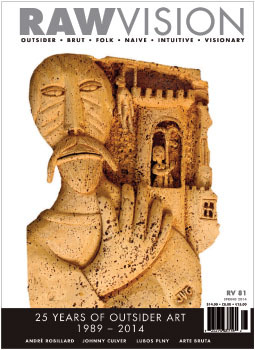 Don't forget to order your copy of RV 81! or click here to subscribe!